Do some cultural sightseeing at El Barri Gòtic and Casa Batlló. Your inner history buff will appreciate La Sagrada Familia and Montjuic Castle. There's much more to do: stroll through Park Güell, pause for some serene contemplation at Barcelona Cathedral, contemplate the long history of Güell Palace, and examine the collection at Picasso Museum. To find other places to visit, reviews, more things to do, and other tourist information, read our Barcelona vacation planner. Playa del Carmen, Mexico to Barcelona is an approximately 21-hour flight. The time zone difference moving from Eastern Standard Time to Central European Time is 6 hours. Traveling from Playa del Carmen in October, things will get a bit cooler in Barcelona: highs are around 26°C and lows about 18°C. Finish up your sightseeing early on the 25th (Wed) so you can travel to Seville. Get some cultural insight at Seville Cathedral (Catedral de Sevilla) and Plaza De Toros De La Maestranza. Get some historical perspective at Royal Alcázar of Seville and Barrio Santa Cruz. 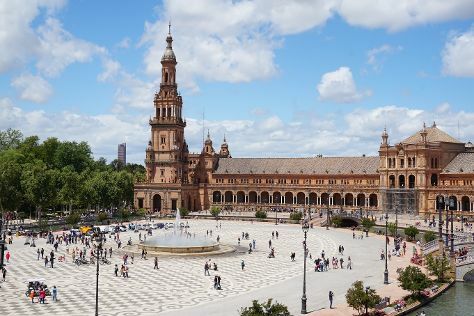 There's much more to do: admire the landmark architecture of Plaza de Espana, browse the exhibits of Seville Museum of Fine Arts, take in the architecture and atmosphere at Capilla de los Marineros, and contemplate in the serene atmosphere at Basílica de la Macarena. To find where to stay, reviews, maps, and tourist information, you can read our Seville travel planner. Traveling by flight from Barcelona to Seville takes 3.5 hours. Alternatively, you can take a train; or drive. In October, daily temperatures in Seville can reach 29°C, while at night they dip to 19°C. Cap off your sightseeing on the 28th (Sat) early enough to catch the train to Madrid. Your inner history buff will appreciate Royal Palace of Madrid and Parroquia San Antonio De La Florida. Get some cultural insight at Museo Nacional del Prado and Thyssen-Bornemisza Museum. There's still lots to do: admire the landmark architecture of Plaza Mayor, admire the masterpieces at Museo Nacional Centro de Arte Reina Sofía, tour the pleasant surroundings at Retiro Park (Parque del Retiro), and don't miss a visit to Puerta del Sol. To see where to stay, traveler tips, more things to do, and tourist information, refer to the Madrid online itinerary creator. Traveling by train from Seville to Madrid takes 3 hours. Alternatively, you can fly; or drive. Plan for little chillier temperatures traveling from Seville in October, with highs in Madrid at 24°C and lows at 12°C. You will have some time to spend on the 31st (Tue) before leaving for home.